We all know that you get what you pay for and tablet devices are (usually) no exception to the rule. Most of the time the best models cost the most and unfortunately that’s just the way the cookie crumbles. However, that doesn’t mean to say there aren’t plenty of cheaper devices out there that aren’t quite as powerful but can still do everything you’d expect from a tablet – and I promise there isn’t an Apple logo in sight. Sure there are all kinds of trade-offs for a much smaller price tag, but if you only plan on getting a tablet to scan through your emails, read eBooks and play Angry Birds now and again, then an expensive iPad might not be worth it in the long run anyway. We’ve collected together five tablets that are available RIGHT NOW for under £100. You can probably pick one up for much cheaper if you buy from an independent Amazon seller, or have a look on eBay, but those prices are subject to change quickly and plus you can’t guarantee what you’re REALLY getting some of the time (and you don’t want to open up the packaging to find you’ve bought a wooden iPad now do you). This cheap and cheerful Disgo tablet runs on Android 2.2 and despite being the cheapest in our list it does have everything you’d expect from a basic tablet including access to (limited) apps, games and some basics already installed, a good screen resolution and WiFi capability. It does seem that you have to sacrifice a few things for the price though, including access to the full Android Marketplace and a fully capable touchscreen. Many online reviews suggest the touchscreen is REALLY frustrating and you literally have to hit it to get any kind of response, which isn’t good when you expect a tablet to be all about the tapping, pinching and scrolling. However, for simple games, watching video and using it as an eReader, it seems to tick all of the boxes despite being so cheap. It also has a 7 inch screen which is perfect for reading, watching and listening on the move while still being super compact. The Archos 7 Home Tablet is another tablet with a 7 inch screen, yet it has 8GB of memory, as well as a memory card slot to add even more. This particular model has been dubbed an “entertainment device”, which is probably a bit of a stretch, but there’s a matt screen which means no glare and fairly decent picture quality to boot, making it ideal for watching video, playing games and reading. 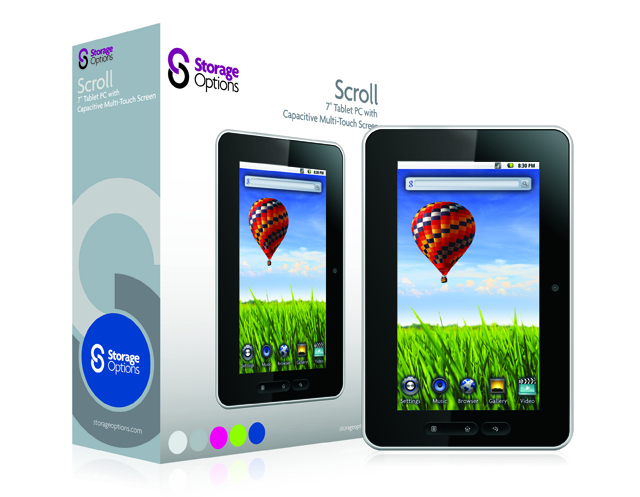 The Scroll 7″ Tablet is part of Storage Options’ new range of cute, compact and most importantly affordable devices. It’s a really robust Android tablet and boasts a capacitive multi touch screen (the same technology used in the iPhone) and screen tilt functionality, meaning you can switch between landscape and portrait seamlessly like you would with an iPad. Like the other models in the cheaper price range, it doesn’t have full access to the Android Marketplace, a fact some people seem to be fine with and others online seem pretty angered by. Again, it’s another device that’s perfect for watching video, browsing the internet and reading eBooks. The Arnova Tablet has an 8 inch screen, making it the biggest of the cheapies. Online reviews suggest it’s great for watching video and the HD quality picture is pretty impressive for such a budget device. However, like the Disgo tablet there are far too many reports that the touchscreen just doesn’t respond well enough, which makes the whole thing feel clunky in comparison to the slick experience we’re used to with the iPad (when we go and play with them in the Apple store that is). The Binatone Homesurf 7 7″ is a very simple, lightweight tablet device which runs on Android 1.6 and has many of the same cons as the rest of the models on the list really, including no Android Market access and quite a poor resistive screen. Its certainly a capable device when it comes to more basic functions, but it’s hardly the best of the bunch despite being (marginally) more expensive. Probably the Archos 7 Home Tablet, or the Scroll 7″ Tablet PC as they seem to be the best all-rounders. There are clearly cons with all of the devices and online reviews tend to suggest people are most unhappy with the lack of freedom when it comes to downloading apps and the seemingly unresponsive touchscreens, but for the price you really can’t be drawing comparisons to tablets that are nearly six times as expensive. All I really want is a wall mounted electronic calendar to synce with my iPhone. I put all mine and my families appointments on it as and when they are made, and am fed up with having to then write them on my wall calendar/chart at home so that the rest of the family know what's happening and when. I can't believe that such a simple thing does not already exist. It would be far to expensive to buy another iPad and wall mount it solely for the purpose of using the calendar function!!!!! For me Apple ipad 2 is still the best. The Archos 7 Home Tablet isn’t going to amaze you with its specs or features, but its low price and core Android features will be the deal breaker.